Rake bars connected to a chain are driven by a hydraulic motor. The bars rake debris into the bucket while preparing soil for sod or seed. 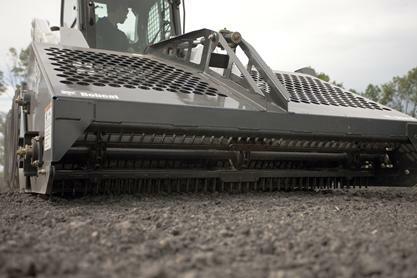 The operator can use the attachment's adjustable side skis to control the depth. A hydraulic cylinder opens the top cover for easy dumping, and allows the bucket and cutting edge to push and scrape debris.